What was so interesting? It is missing the monogram on the reverse side of the bottle! Is that one of them "funny R's" in Peruvian and Bitters? Got a call well before this lot closed from a seasoned dealer south of the State of Jefferson. He was kicking himself in the ars. He'd picked up the same no reverse embossing variant at a show last year, thought it was neat and different and re-sold it at the same show. He was pleased with the meager profit; at that time. While it is a strong price for a Peruvian, I believe it is the very first variant of this bottle. It is the only one I have ever seen, and if one is going after RARE and not only the beautiful, this example fills the bill. 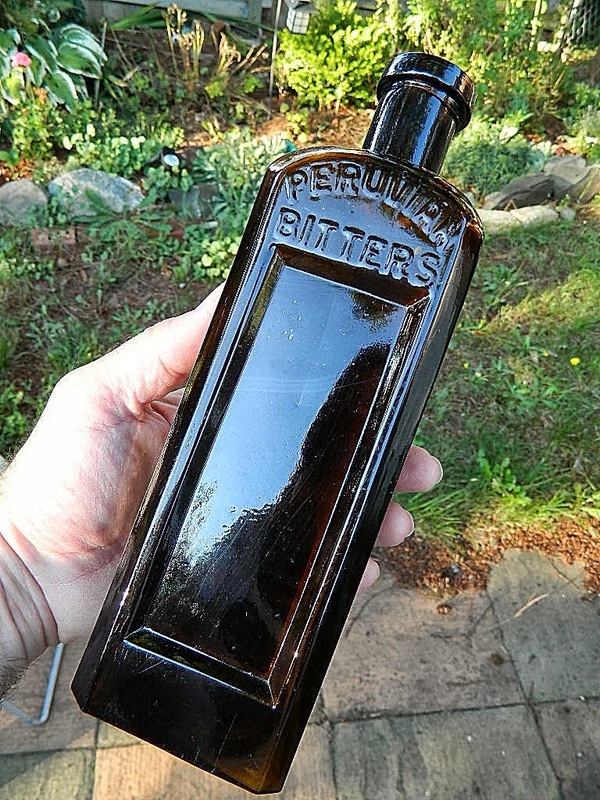 From a foot away, it looks like a $75 Peruvian, but is an important piece of western bitters history. I guess if an amber Cundurango sells for $2500 or more, this one is a relative bargain. By the way, I did not win the Peruvian and cried "uncle" when the bidding reached four figures. Now I have regrets that I did not go a bit higher, but who knows how high DD would have gone. He got a good one! Dale M.
I have an example of this variant that I dug in San Luis Obispo about eight years ago. It is the same color as this one. Were up to 3 known now.